Alexandra Robiana, one of the Identity facilitators, prepares to give some materials. There is a new program at Blair called Identity. Identity is an after school program that focuses in leadership skill building, HIV and substance abuse prevention, and other things important for teenagers. Identity is a nonprofit organization that was created five years ago for the Latino youth in the metropolitan area. The mission of Identity is to prepare the next generation of Latino leaders. 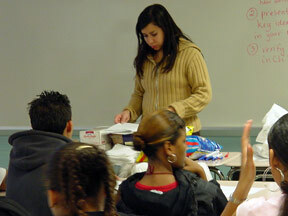 This program was brought to Blair partly because of Sandra Gutierrez, an ESOL teacher at Blair. She found out about Identity and thought it was an important experience for the Latino students at Blair. She met Candace Kattar, and Diego Uriburu, the co-executive directors of Identity and talked about bringing the program to Blair. Identity has had some programs in D. C. and some other parts of Maryland. However, this is not the first time Identity has had meetings with teenagers in the Montgomery County area. Identity started last year at Gaithersburg High School where Melissa Athie and Juan Pablo Zarruk, the facilitators of the Blair program, also work on Tuesdays and Thursdays after school. Alejandra Robaina also helps at Blair this year. Teresa Wright, one of the coordinators of the Gaithersburg High School Identity program, said that the fact that the program is there helped the students get more disciplined and more responsible in their activities in school, "Thanks to Identity, students who were in the program last year have changed a lot. Their attendance has improved and their attitudes too," she said. Melissa Athie added that "It's helped prevent a lot of gang violence and it's really helped the students to stay in school." Whenever the group meets they do some activities to enhance the topic of the day. The facilitators of the program try to make it fun and entertaining. Sometimes the students get the opportunity to practice being a leader, do individual activities and also try some partner activities. "We try to make it active so they don't feel like they're in school," Melissa added. The program lasts one school semester and has as a culminating activity a retreat where the students and facilitators have the chance to see the changes done during the program. Melissa Athie thinks that the students at Blair go through the same problems the students at other schools go through and she thinks they can make a difference with the students in the program. "What we want most is for the youth to think about the decisions they make and how it affects their future," Melissa said. Identity usually has 25 students each semester, but the facilitators made an exception letting 27 students in the program here at Blair. Because there are so many students, the facilitators have to divide the students in two groups so every student can get more quality time with an adult. "It is also good when we do very personal activities or emotional activities. That way they are not talking in front of so many people, which makes them feel more comfortable," Melissa said. Teen-pregnancy is one of the topics the facilitators take time to talk about how to prevent it and that no one can force them to do anything if they do not want to. "We want them to think about everything before they make the decision," Melissa added. The students in the program at Blair had to fill out applications and get their parents approval before they could join the program. Parents of the students involved in the program like the idea of their kids getting into programs like Identity because they think it is helpful that Latino students learn these important topics. "Mama says it is good because we are learning how to protect us and not get pregnant," one of the students in the program said. Identity meets at Blair on Mondays and Wednesdays from 2:30 to 4:30 p.m. Identity is for 9th and 10th grade Latino students who would like to learn how to be a leader. Also being in the program gives the students community hours. Each time they meet the students get two hours and by the end of the program each student receives about 60 hours of community service.